The self-adhesive polyester underpacking foils of the Folabase range are characterised by high resistance to swelling in the presence of damping solution and washing agents. They are used to adapt the cylinder circumference and printing length on sheet-fed and web presses. The self-adhesive versions support automation, particularly on presses with automatic plate changers, and simplify subsequent handling. Folabase H48 is the result of a further development of the well proven and valued underpacking foil classic, Folabase H45. One of the main innovations are the corrosion-inhibiting additives protecting the cylinder surface. The foil can be easily applied to almost all cylinders and can be removed quickly and cleanly with very little cleaning effort. The foil's release film consists of siliconised propylene which prevents wrinkling and avoids dust inclusion. Due to its high resistance to chemical cleaners and solvents and – like all Folabase adhesives – a very good thermal stability on the press, Folabase H48 is characterised by a long service life. In contrast to paper-based underpacking sheets, the tear-resistant, dimensionally stable polyester does not suffer any reduction in thickness when exposed to excessive pressures. 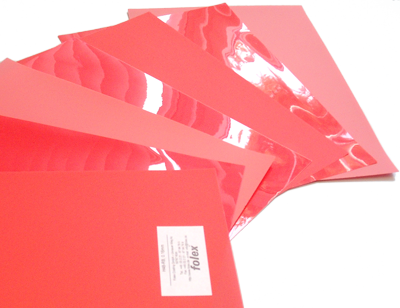 Since they contain no PVC, used foils can be disposed of without difficulty. Printing blankets, underpacking material, measurement instruments and press room accessories: Download here the current product range brochure (0.9 MB).